"A prolonged bull market across stocks, bonds and credit has left a measure of average valuation at the highest since 1900, a condition that at some point is going to translate into pain for investors, according to Goldman Sachs Group Inc."
When has the market ever been below what it was in 1900? I wonder how far away a "full house sell signal" is? 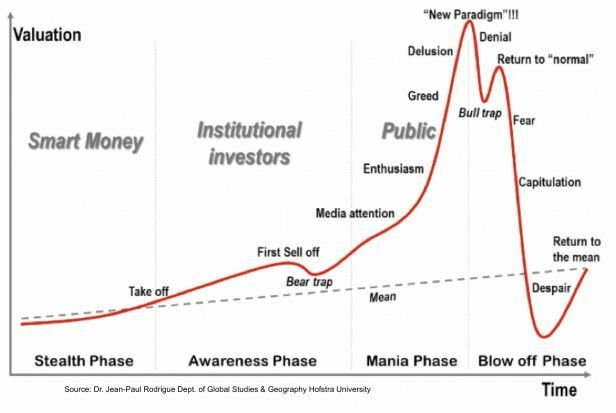 "the full house buy" in september 2015 nailed the bottom..
Morgan Stanley has advised clients to slash exposure to the stock market after its three key warning indicators began flashing a "Full House" sell signal for the first time since the dotcom bust." "Morgan Stanley chief equity strategist Mike Wilson has expected the S&P 500 to reach 2,700before selling off in a sharp correction, but now he expects the S&P to go higher to peak at 2,750. " "The Morgan Stanley strategists said the stock market has yet to see the "full-blown euphoria" they called for in the beginning of the year, and the final missing ingredient to bring the bull market to an end could be new flows from retail investors. "We suspect that could happen in early 2018 with the signing of a tax bill,""
now they are talking about 3 000..
""Buy Puts Now": Morgan Stanley Issues A Warning As S&P Calls Hit All Time Highs"
"First this is not a call for the final top – positive sentiment and positioning can have momentum of their own and absent some kind of shock likely take the market higher. But the rally is getting more fragile – as MS Equity Strategist Mike Wilson notes in Weekly Warm-up: Euphoria! (Jan 16, 2018) "The bottom line is that we have entered the late cycle euphoria stage we predicted a year ago.” and “it is more likely the S&P 500 will reach our bull case of 3,000 before it's over. We just want to make sure investors appreciate this is higher, not lower risk than the rally we experienced last year.”"
How is it higher risk? What is higher risk? Higher risk is take your money out of high dividend and capital gaining stocks and shares and stick it in what exactly? The great unknown! That's risk to me. Trump's just given away trillions of corporate tax cuts. Where are those trillions going? Not only that, they'll be raising debt and selling TBs to finance that debt. Hey presto more money to services social payments. Money has got no where else to go but the stock market! Sell the dollar buy the Euro. Watch this space. The Euro Draghi's still doing QE, that's how far behind the curve he is ! Oh, and he's just been told to lose his membership of the G30 bankers club. Anything can happen in a currency war and in times like these they have less relevance. The Eurozone is screwed, doesn't matter how long it takes, it's still screwed. It does matter in our life time. You are becoming such a cop out. Keep your eye on the other ongoing disputes too. Sweden, Hungary, Austria, etc. Btw, has Merkel formed a govt yet? Here is what I posted JUN 9, 2014, 6:09AM almost 4 years in advance! My figuring was 100% correct. Target hit. So much for all the Chicken Little dunces and their “Sell in May and go away” doctrine. The markets are going to the moon; Inflationary boom! This isn’t an official forecast but I’d say this market has another +50% to go before there is any major correction. There is a kind of hubris starting to develop...just as one would expect in an inflationary boom. Although I’m not posting much these days I still read posts on Trade2win. It’s important for me to keep in touch with how the ‘public’ is thinking! The psychopathic Central Planners continue their financial repression while trying to brainwash you into believing that inflation is good for you. By my reckoning the next financial crisis isn’t too far away, probably around 2016-2017, but it might just be possible for the insane and psychotic Central Planners to INFLATE-REPRESS-DENY for longer than even I can imagine. But make no mistake; the Central Planners have every intention of inflating their way out this predicament. So even when (if) they start to raise interest rates it will only be a token effort to make it look as if their over leveraged economies are stronger. They will raise rates so impossibly slowly, in absurdly tiny increments to ensure they are always a long way behind the inflation curve. Don’t expect to see any Gerald Ford style “Whip Inflation Now” campaigns...that is from a bygone era when Central Planners kept inflation to a minimum as opposed to today where they are doing the very opposite. The poor and low income earners will suffer, but they are disregarded. All that matters is the deflation bogeyman is destroyed. I notice that all the retarded Socialists aren’t concerned about anything. The clueless imbeciles who claimed that Socialism bailed out Capitalism during the 2008 panic and then jumped on the “Occupy” bandwagon don’t see any problems with what the Central Planners have created. They are probably so stupid that they believe this is a real economic recovery made possible by the “Massive Advantage” a Central Bank has with control of the money supply. They aren’t expressing any concerns about the grotesque distortions in the economy which are the direct result of Central Planner intervention since 2008 and prior! They are so clueless they actually believe the establishment media propaganda who tells them we are experiencing real economic growth rather than inflationary growth. But when the next crisis comes they will be the ones screaming at the top of their voice that Capitalism got out of control and “greedy” bankers are to blame. They won’t tell us exactly when the Socialist Central Planners handed the economy over to Capitalism. Their trick is more of a “heads they win tails we lose” situation. They will try and convince you that when things appeared to be good, it was thanks to the policies of our Socialist Central Planners and things went wrong when they allowed Capitalism to take over. But I know the truth and so should everyone who has been reading my journal. Unlike the last Financial Crisis where only a few understood what was really going on and accurately forecasted the crisis, everybody should see the next financial crisis coming. There are no excuses this time. Pay close attention to what Atilla is saying now because he will be the FIRST person to blame Capitalism and/or the Republicans when it all goes wrong! Mate no need to wait. I'm blaming them now is it not obvious? Watch where the dollar falls?